A rich, chocolatey cake flavoured with coffee and sweetened with applesauce and beets. 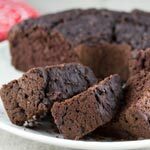 Half a cup of strong coffee is added to this recipe to enhance the chocolate flavour and add richness to this dense, moist cake. Preheat the oven to 350 F. Grease the bottom and sides of a tube pan. In a large bowl, cream the butter with an electric hand mixer until fluffy. Beat in applesauce and eggs and mix until blended. In another bowl, whisk together milk, beets, coffee and vanilla. In another bowl, sift together the flour, cocoa powder, baking powder, baking soda and salt. Using a spatula, stir a third of the flour mixture and half of the milk mixture into the butter mixture. Repeat, and then stir in final third of the flour mixture until blended. Bake for approximately 50 minutes, or until a tester inserted into the cake comes out clean. Let cool in pan for 15 minutes, then turn cake onto wire rack to cool completely. To cook beets, wrap whole, unpeeled beets in foil and bake in a 350 F oven for 1 hour. You can also simmer whole, unpeeled beets in water until tender, approximately 1 hour. For a sweeter cake, replace the 3/4 cup of unsweetened applesauce in the Mildly Sweet recipe above with 1/2 cup sugar. Cream the sugar with the butter in step 2 and omit the unsweetened applesauce. Adapted from: Natural Red Velvet Chocolate Cake with Beets from lcbo.com.